With a powerful 15kw (20hp) motor, planetary 6-head 4 v-belt drive system, the DFG1000 is superbly designed to grind large surface areas to very fine, highly polished surfaces without the swirl marks attributed to other grinding systems. 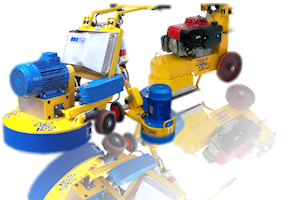 The patented 6-head design has 4 rotating and 2 counter rotating heads ensuring optimum balance during the grinding process, allowing the machine to grind more efficiently. The balance of the machine is so precise that it can be tilted on its rear wheels with ease by pulling down on the handle at the top of the unit above the driver’s seat. This means that visual inspection and change of tools can be performed quickly, efficiently and safely. With a 1000mm grinding width, the DFG 1000 is capable of very high production rates, although this is dependent on the type of surface and the grinding process. A magnetic and pin guide based system also makes tool changing quick and efficient with a selection of both metal and resin tools available. Designed for dry grinding, no water tank is supplied; however, the DFG 1000 is designed to work with water as well.